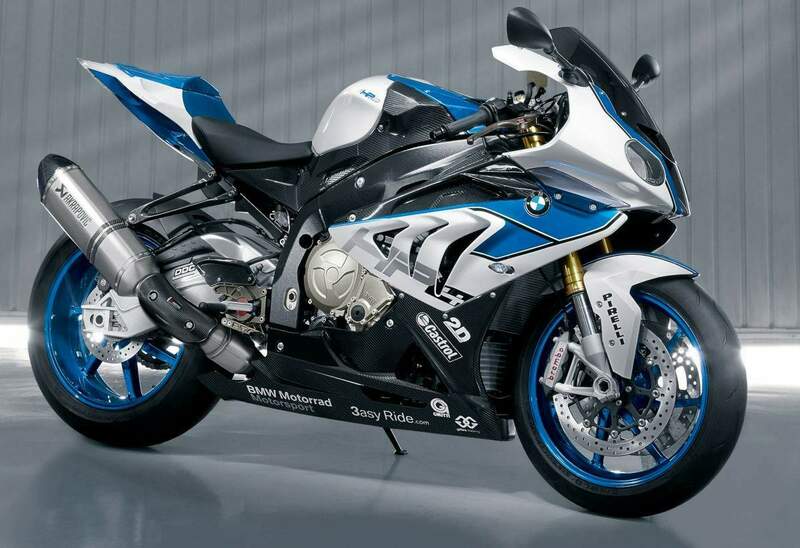 With the BMW HP4, BMW Motorrad presents the lightest 4-cylinder supersports bike in the 1000cc class to date. Based on the BMW S 1000 RR, the new HP4 has an output of 193 hp (142kW) and has a dry weight of 373 lbs (169 kg) including Race ABS . Race ready with a 90% full fuel tank just 439 lbs (199 kg). 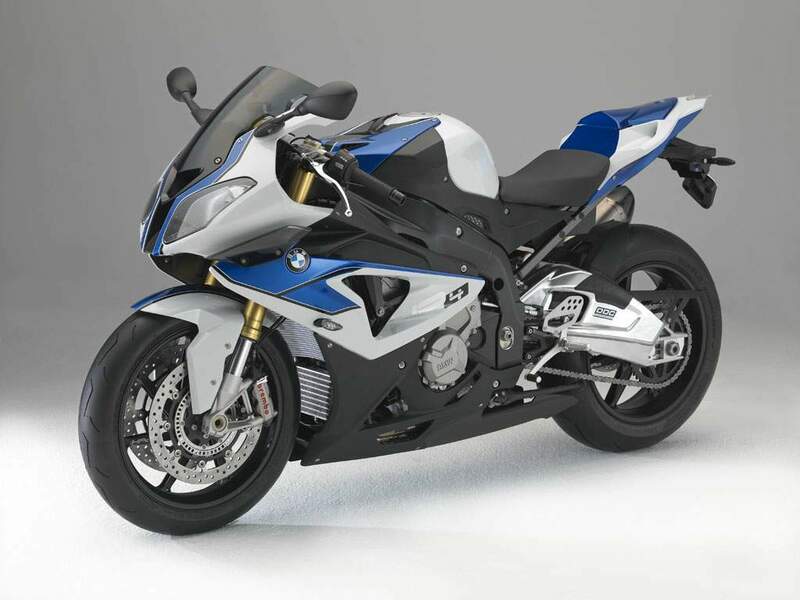 The new BMW HP4 sees its world premiere in 2012 and is a continuation of BMW Motorrad's HP model series founded in 2005. After the boxer models HP2 Enduro, HP2 Megamoto and HP2 Sport, the BMW HP4 is the first 4-cylinder motorcycle in the HP family. The HP label stands for high performance, and the HP4 once again embodies outstanding handling, power and riding dynamics. But it also reflects the use of extremely high-quality materials and intelligent technology, carefully conceived down to the last detail. The new production HP4 is immediately ready for use on the race track, requiring no elaborate modifications. However, at the same time it offers great potential for dynamic road riding. The new HP4 - exclusive performance based on the S 1000 RR. Since its international press presentation in autumn 2009, the S 1000 RR has attained many successes - and not just in motorcycle magazine comparative tests. This is clear evidence of the qualities and the consistency of the supersports concept. Equipped with Race ABS and Dynamic Traction Control (DTC), the S 1000 RR set a new benchmark in this hotly contested and technologically sophisticated segment. But even the S 1000 RR left some room for improvement. 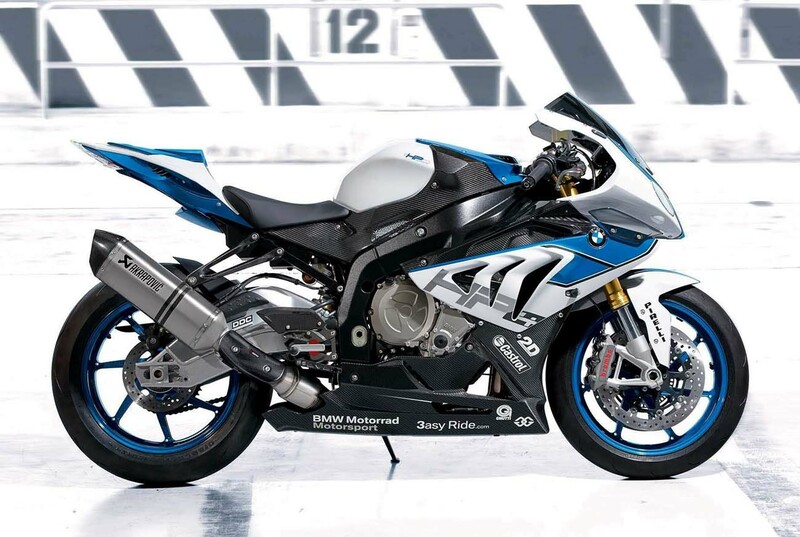 The HP4 provides the homologation basis for the use of BMW motorcycles in motorcycle racing, especially in the superbike and superstock category. The new model features numerous technological innovations which highlight its orientation towards racing and the race track. The standard passenger seat cover ensures the monoposto (solo rider) look so characteristic of the race track. But for riders who would like to travel with a passenger, BMW Motorrad also offers a passenger package as a factory production option. In addition to the passenger seat, this includes the passenger footrest system. Dynamic Damping Control DDC - a world first in production motorcycle construction. The new HP4 reflects its status as a high-performance motorcycle in terms of its suspension system with a world first for production motorcycles: it is standard equipped with Dynamic Damping Control (DDC). This system allows dynamic damping adaptation of the upside-down fork and spring strut to the specific riding conditions on the road. The damping adapts to the current riding maneuver or road surface by means of sensors and electrically controlled regulation valves. The HP4 offers optimum damping in every riding condition to provide maximum traction and safety. High Performance brake system and Race ABS with IDM setting for maximum brake performance. With the introduction of Race ABS in the S 1000 RR, BMW Motorrad underscored its pioneering role in the area of ABS. For the first time ever, an antilock brake system was consistently tailored to sport riding. With the new race-oriented HP4, BMW Motorrad now takes the next step. Designed specifically for race track and dynamic road riding, the new bike not only has Brembo monoblock brake calipers and 9x floating brake discs at the front but also a further developed and refined Race ABS. As before, this ABS has four different modes for wet surfaces ("Rain"), roads ("Sport"), race track with supersports tires ("Race") and race track with slicks ("Slick"). Racing experience gained from the IDM (International German Motorcycle Championship) has been fed directly into the Race ABS equipped HP4. In "Slick" mode, the so-called IDM setting with refined regulation impulses now gives the skilled rider the option of maximum possible deceleration. New 200/55 ZR 17 tires on the rear wheel and finely adjustable Dynamic Traction Control in "Slick" mode. The HP4 uses a rear tire in the new format 200/55 ZR 17. The Dynamic Traction Control (DTC) already used in the S 1000 RR has been optimized for supersports use in the HP4: now the effect of traction control can be adapted in "Slick" mode to changing road conditions and the rider's individual preference while riding. The HP4 is the first BMW motorcycle to have a Launch Control function which provides active support for the rider in "Slick" mode to achieve maximum acceleration from standing - for example on race starts. Launch Control limits engine torque so as to provide the maximum torque transferable to the rear wheel. This means the rider has to focus less on the throttle because he is controlling acceleration solely using the clutch. In addition, when Launch Control is activated, engine torque is reduced as soon as the system detects front wheel lift. This prevents unwanted wheelies when accelerating. The HP4 allows the rider to make instant gearshifts with virtually no interruption of traction force by means of the shift assistant, equipped as standard. This helps gain valuable fractions of a second on the race track, too. Weight reduction - Forged wheels, lighter sprocket carrier, titanium exhaust system and lighter battery. New 7-spoke wheels in forged light alloy and a new, lighter sprocket carrier give the HP4 a weight reduction of 5.3 lbs (2.4 kg) as compared to the S 1000 RR. The exhaust system is made entirely of titanium and saves as much as 9.9 lbs (4.5 kg) as compared to the S 1000 RR, thereby enhancing the HP4's handling qualities. The new exhaust system has a resonance pipe between cylinders two and three, a controlled acoustic valve and a closed-loop catalytic converter. It has been possible to improve the torque curve thanks to the new exhaust system, with the engine application adapted accordingly. Enhanced engine set-up and increased torque in the mid-range. The new HP4 is equipped with the water-cooled 4-cylinder in-line engine of the S 1000 RR with a peak output of 193 hp (142 kW) at 13,000 rpm and a maximum engine speed of 14,200 rpm. As in the S 1000 RR, its maximum torque of 83 lb-ft (112 Nm) is achieved at 9,750 rpm. The torque has been perceptibly increased in the 6,000 rpm to 9,750 rpm range. In "Rain" mode there is now a smoother output and torque curve available between 2,500 rpm and 8,000 rpm. Unlike the S 1000 RR, the 4-cylinder in-line engine in the HP4 provides the full output of 193 hp (142 kW) at 13,000 rpm in all modes - "Rain", "Sport", "Race" and "Slick" - with an identical throttle curve making it perfect for use on the race track. Supersports - accommodation for sporty riders. The HP4 has numerous special features to meet the needs of sports and racing riders. For example, the instrument cluster not only has a newly designed dial face with HP4 inscription but also provides an extended range of information and functions. The information display now shows the DDC set-up menus as well as the figures for DTC adjustment and Launch Control activation. Styling of the new HP4 shows supersports aspirations for the race track and for dynamic public road riding. 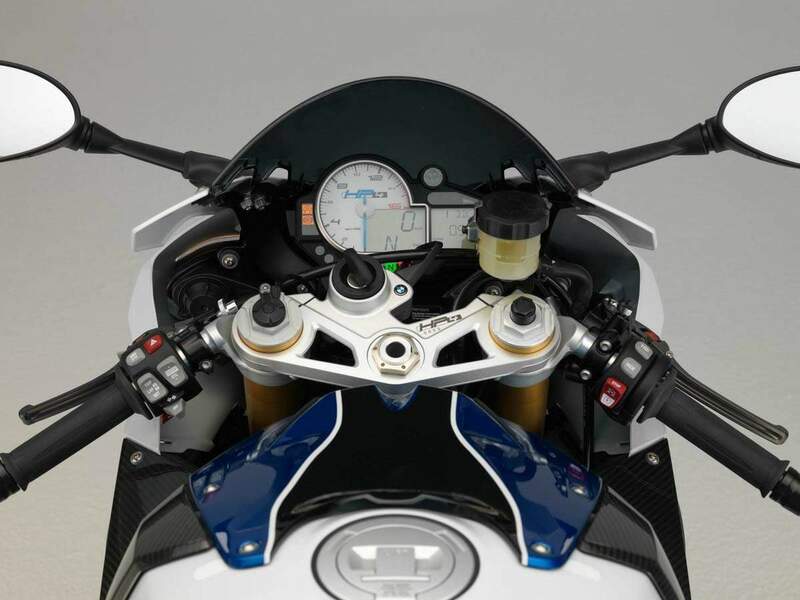 In addition to the monoposto (solo rider) look there is a dual-section engine spoiler - elongated as compared to the S 1000 RR which highlights the increased dynamic performance of the HP4. The laser-engraved HP4 logo with serial number on the upper fork bridge underscores the bike's exclusive character. An elaborate multiple color paint finish in Racing Blue Metallic/Light White creates an appropriate racing-oriented appearance. For anyone who wants even more than the functional sophistication and extreme riding dynamics of the HP4, the HP4 with Competition Package is an especially exclusive version of the motorcycle. Refined HP carbon parts including a long, closed HP engine spoiler in carbon, an adjustable HP rider footrest system, folding HP brake and clutch levers, wheels finished in Racing Blue Metallic and a factory sponsor sticker kit provide additional enhancement of the new HP4. When light weight, massive power and razor-sharp handling are combined, the result is known as HP - High Performance. The new HP4 is BMW Motorrad's first 4-cylinder model to wear the HP badge. Based on the S 1000 RR, a purebred factory motorcycle has been developed - made from the very best materials and molded into unparalleled design. The new HP4 comes into its own with its refined paint finish in white and Racing blue. The HP4 will only be available in limited numbers through 2014.
o Fork bridge with engraved number and HP4 logo. o Innovative suspension with Dynamic Damping Control (DDC). o Race ABS with IDM setting. o Dynamic Traction Control (DTC) with fine tune adjustment in "Slick" mode. o New rear wheel tires, 200/55 ZR 17.
o Shift assistant as standard equipment. o Light titanium exhaust system with controlled acoustic valve and resonance pipe. o Forged light alloy wheels, anodized in black. o Radial monoblock brake calipers by Brembo with special brake pads. o 9x floating brake discs at front. o Extended, dual-section engine spoiler. o Seat in monoposto look with passenger seat cover. o Lighter 7 Ah battery. o Increased torque in the medium engine speed range. o Long, closed engine spoiler made of carbon. o Sponsor sticker kit included. o Wheels in Racing Blue Metallic. o HP Carbon badge carrier. o HP Carbon tank cover. o HP brake lever, hinged. o HP clutch lever, hinged. o HP rider footrest system, adjustable. Dynamic Damping Control (DDC) - dynamic damping adjustment to match road and track conditions. BMW Motorrad has stood for leading expertise and groundbreaking innovations for 90 years, and this applies equally to the area of suspension. One example among many is Electronic Suspension Adjustment (ESA) introduced in 2004, a system for the electronic adjustment of damping and spring tension. Five years later this system was produced in the BMW GS models under the name of Enduro ESA, allowing the suspension to be raised for off- road use. In 2008 BMW Motorrad presented today's ESA II, permitting electronic adjustment of the spring rate for the first time, allowing adaptation to varying load conditions. Dynamic Damping Control (DDC), produced in the HP4 as a world premiere in a road-legal production motorcycle, goes one step further. This system involves dynamic adaptation of compression and rebound stage damping to adjust to given riding conditions, for example, fast changes of direction in chicanes or uneven stretches of road. The semi-active suspension system reacts automatically to maneuvers such as braking, accelerating and cornering on various road surfaces and sets the correct level of damping by use of electrically actuated damping valves. The basic settings of Dynamic Damping Control (DDC) are linked to the modes "Rain", "Sport", "Race" and "Slick", which can be conveniently selected by the rider at the press of a button. The set-up menu in the instrument cluster allows the damping to be adjusted more closely to the rider's preferences. Similar to a mechanical adjustment, it is possible to apply a softer (-7) or a tighter (+7) set-up. The adjustment of the spring preload is carried out by hand using a 17 mm wrench. In the "Rain" and "Sport" mode, the DDC set-up focus is on a full, comfortable damping as preferred when riding on public roads or on poor to smooth roads. In the "Race" and "Slick" modes, however, the DDC set-up is geared more towards performance, supporting a very sporty riding style on the race track in particular. Damper set-up is tight and gives the rider clear feedback at all times. The great benefit of DDC lies in the fact that it is dynamic, allowing damping set-up to be adjusted while riding. During development of the DDC, BMW Motorrad also benefited from synergies with BMW automobiles, where this technology has been used in production for some time. The challenge was in adapting it to motorcycle physics and integrating the appropriate control systems. Damping adjustment within the millisecond range is done by means of an electrically controlled valve with a piston ring movement, adjusting the flow of the damper oil. This means that the HP4 provides the best setting for damper rebound and compression stage in each riding condition. Compromises in terms of suspension set-up are a thing of the past. DDC provides maximum traction for optimum deployment of engine power during acceleration. When the ignition is switched on and before moving, the system check is activated first, initiating the flow of information from the engine control system, sensor box and spring travel sensor to the Dynamic Damping Control DDC. The DDC control unit processes a large amount of information relevant to driving dynamics such as spring travel, road speed and throttle valve position. The sensor box also supplies information to DTC on the banking angle of the motorcycle and other parameters. The two fork legs of the DDC upside-down fork are identical in structure - the difference lies in the interior of the fixed fork tube and slider tube. The setting mechanism for the 15 mm (on the S 1000 RR is 20 mm) variable spring preload, is in the right-hand fork leg. The valve responsible for increasing pressure of damping power is housed in the damper cartridge of the left-hand fork leg, together with its electrical connection. The balancing chamber in the lower section of the left-hand fork leg is subjected to increased gas pressure and absorbs the displaced volume of oil from the damper piston rod in the closed cartridge. As standard, the telescopic fork damping is controlled on an integrated basis and not separately for the rebound and compression stage. However, the wiring harness of the HP4 is equipped with a connection for a linear spring travel sensor at the fork. The control unit detects when the sensor is connected and extends the menu in the instrument cluster to include a separate rebound and compression stage setting. This sensor is available as an aftermarket accessory. The new DDC spring strut is bolted onto the frame by a light alloy insert, the so-called sliding block. The motorcycle is factory supplied with a 0 mm insert. The two included inserts (1.5 and 3 mm) allow the rear of the motorcycle to be raised and the suspension geometry to be quickly adapted to prevailing road conditions and the rider's individual preferences. When using a different sliding block, the rear spring travel sensor has to be calibrated accordingly using the set-up menu. At the front the adjustment is made in the usual manner by means of the fork bridge clamp. Race ABS with IDM setting - for top brake performance on the race track. BMW Motorrad was the first motorcycle manufacturer in the world to equip its motorcycles with the antilock system ABS over 20 years ago, setting a milestone in active motorcycling safety at the time. Today all BMW motorcycles throughout the world are equipped with ABS as standard. With the introduction of the S 1000 RR in 2009, BMW Motorrad added another milestone in brake technology when it launched Race ABS, specially tailored to the supersports needs of the S 1000 RR. 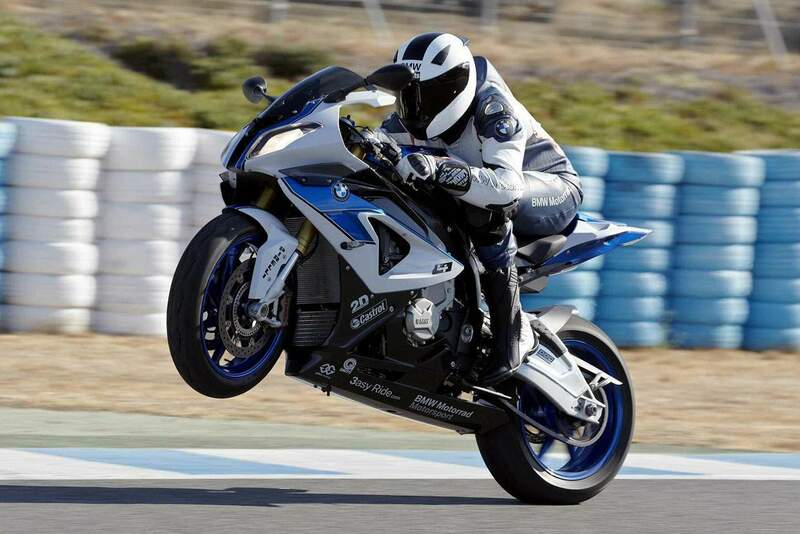 BMW Motorrad now takes another step forward in the HP4. The system has been further refined and in particular adapted for use on the race track. As before, it has four different modes for wet surface ("Rain"), road ("Sport"), race track with supersports tires ("Race") and race track with slicks ("Slick"). In the modes "Rain", "Sport" and "Race", the Race ABS operates on a partially integral basis, in other words, the rear wheel is automatically braked when the front wheel brake is activated. This ensures that the motorcycle remains considerably more stable while braking achieving very short braking distances. In "Slick" mode, the Race ABS setting in the HP4 is now at maximum deceleration, giving the rider transparent feedback on traction at all times. The new IDM setting - developed during the German Superbike Championship - allows maximum deceleration at the grip limit of the tires. In this mode, both the rear wheel lift detection and ABS function are deactivated for the rear wheel, allowing skilled riders to control the HP4 using the rear wheel brake and perform brake drifts. New rear wheel tire, size 200/55 ZR 17. Finely tunable Dynamic Traction Control in "Slick" mode. The HP4 now features a rear wheel in the new 200/55 ZR 17 format. Dynamic Traction Control (DTC) has been optimized for supersports use in the HP4. While riding in "Slick" mode, the DTC can be adjusted to changing grip levels by using the switch "Slick +/- DTC" on the left-hand control panel on the handlebars. This now offers the rider more flexibility to environmental conditions such as air and asphalt temperature and changes in tire grip and road surfaces. The adjustment range is in seven increments via 0 to +7. Level 0 corresponds to the "Slick" mode setting familiar from the S 1000 RR, while - 7 represents a significant reduction in control intervention. This allows much more powerful slides to be performed. By contrast, the DTC system intervenes much more perceptibly at +7. Launch Control - for optimum acceleration and starts in "Slick" mode as well as wheelie detection. A high level of skill is required to effectively turn power into forward thrust when accelerating from a standing position - as when starting a race for example - especially in the case of a high-performance supersports bike. For this reason, the HP4 is the first BMW motorcycle to offer a Launch Control function which provides active start traction support for the rider in "Slick" mode. In order to ensure full acceleration from a standing position, Launch Control limits engine torque so as to provide the maximum torque transferable to the rear wheel. This means the rider has to focus much less on the throttle because he is controlling acceleration solely using the clutch. He can leave the throttle virtually wide open. During the actual starting process engine speed is limited to 8,000 rpm; when the 37.28 mph (60 km/h) mark is passed this limit no longer applies. If the rider shifts into second gear, the engine torque is automatically corrected to allow for the change in gear ratio, once again transferring maximum torque to the rear wheel. Launch Control is deactivated when third gear is engaged, when the motorcycle reaches a banking angle of over 30 degrees or when the rider switches into a different DTC mode. The function is also deactivated if the ignition is switched off or if the engine stalls. The HP4 also supports the rider when Launch Control is activated by means of the adapted wheelie detection function, which reduces engine torque as soon as any lift is detected in the front wheel. If Launch Control is not activated, wheelies are permitted in "Race" mode at a banking angle of under 25 degrees and in "Slick" mode at less than 30 degrees. Shift assistant for upshifting with virtually no interruption of traction power. The shift assistant is a standard feature of the HP4. It enables the rider clutchless upshifting under full throttle virtually without any interruption of traction force. Here the ignition and fuel feed are interrupted for a fraction of a second. The aim is to save valuable lap time when accelerating. Light forged wheels and an even higher performance brake system. The new HP4 features high-quality forged light alloy wheels to reduce rotating masses, offering optimized acceleration, deceleration and handling. 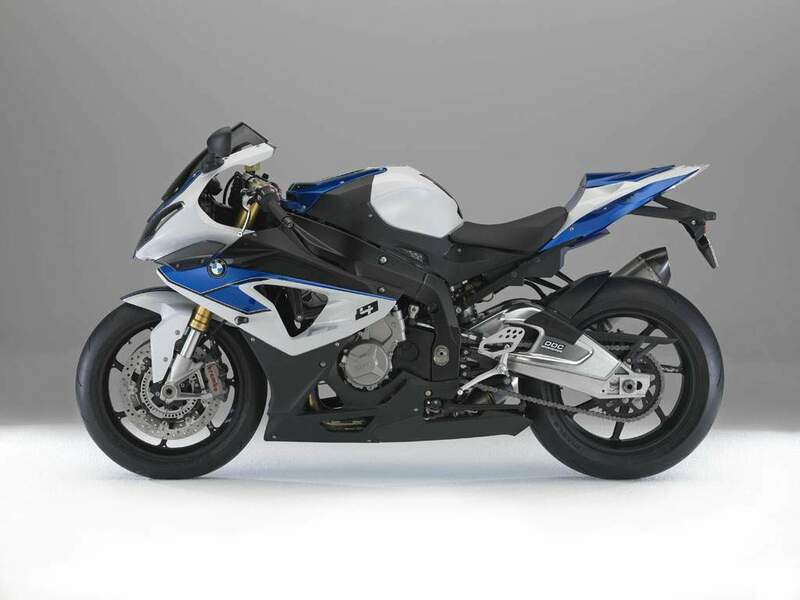 The new 7-spoke wheels weigh 5.3 lbs (2.4 kg) less than the wheels of the S 1000 RR. In the HP4 the wheels are finished in anodized black, while the HP4 with Competition Package has wheels finished in Racing Blue. Further weight reduction is achieved using a new, lighter sprocket carrier and a smaller and lighter battery with a capacity of 7 ampere-hours. The front brake system has 9x floating brake discs with a diameter of 12.6 Inches (320 millimeters) and radially arranged Brembo monoblock brake calipers. Brake pads developed especially for the HP4 produce improved brake performance, excellent stability on the race track and outstanding handling. Performance oriented engine with improved torque range. The new HP4 is equipped with the water-cooled 4-cylinder in-line engine of the S 1000 RR with a peak output of 193 bhp (142 kW) at 13,000 rpm and a maximum engine speed of 14,200 rpm. Its maximum torque of 83 lb-ft (112 Nm) is achieved at 9,750 rpm. The 4-cylinder in-line engine in the HP4 now provides full output in all modes "Rain", "Sport", "Race" and "Slick" with an identical throttle curve and same throttle response - preferred when riding on the race track. For more powerful acceleration out of a curve, the torque has been increased in the 6,000 rpm to 9,750 rpm range. For "Rain" mode, output and torque have been smoothed out in the 2,500 to 8,000 rpm range. This also adapts the motorcycle's characteristics to conditions in which there is reduced grip. Light titanium exhaust system with controlled acoustic valve and resonance pipe. The new exhaust system, made entirely of titanium, reduces the weight of the HP4 by 9.9 lbs (4.5 kg) as compared to the S 1000 RR. The new exhaust system has an resonance pipe between cylinders two and three, a controlled acoustic valve and a closed-loop catalytic converter. The torque curve has been improved thanks to the new exhaust system. Instrument cluster - Newly designed dial face and extended range of information. The new HP4 has a newly designed dial face with HP4 inscription and also provides three new information items. The information display now shows the DDC set-up menus as well as the figures for DTC fine adjustment and Launch Control activation. Supersports design with monoposto look and elongated engine spoiler. The HP4 fully lives up to its dynamic aspirations in terms of visual appearance. The bike is equipped with a passenger seat cover in keeping with its preferred solo use for sport riding purposes. However, a passenger package (passenger seat including passenger footrests) is available as a factory option for riding with a passenger. There is also a dual-section engine spoiler - elongated as compared to the RR, which emphasizes the dynamic qualities of the HP4. The exclusivity of the HP4 is identified by an HP4 logo with serial number applied by laser engraving on the upper fork bridge. The serial numbering does not apply separately to HP4 and HP4 Competition Package but is continuous. The new HP4's special color scheme reflects a profile more closely geared towards the race track as well as very sporty riding on public roads. In conjunction with the HP4 logo, an elaborate multiple color finish in Racing Blue Metallic / Light White gives the new HP4 an aggressive, dynamic and high-quality touch. The black-coated frame, the silver anodized swing arm and the black anodized wheels also provide a fascinating technical contrast. The HP4 with Competition Package goes one step further. Wheels finished in Racing Blue Metallic, numerous carbon parts such as the long engine spoiler and a included sticker kit enhance the HP4 with Competition Package to a greater extent, giving it an even more dynamic look. 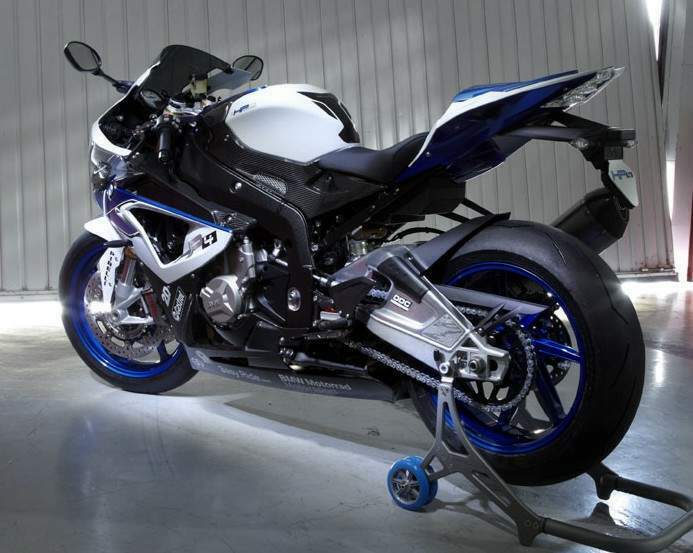 In line with the premium quality of the BMW HP4, the painted parts are covered with an additional clear coat. o Long closed engine spoiler made of carbon. o HP Carbon wheel cover, front. o HP Carbon wheel cover, rear. o HP passenger footrest system. o HP Carbon chain guard. o HP Carbon heel guard. o HP Carbon slipstream deflectors. o HP Carbon tail-hump cover. o Motorcycle cover (outdoor and indoor). o HP Race data logger. o HP Race Power Kit. o HP Race Calibration Kit II (TBA). o HP Race Cover Kit. o HP Race gearshift-pattern reverser. o HP Race brake pads. o HP Race tire warmers (TBA). o HP Race wiring harness (TBA). o HP Race pit carpet (TBA). o HP Race Engine Kit I-III (TBA). o HP Race gearbox (TBA). BMW Motorrad HP Race Support Packages featuring technical support for private and professional racing.